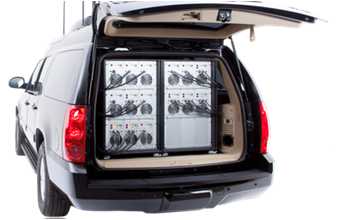 The Convoy Jamming System uses Direct Digital Synthesis Sweep and dedicated software to maximize its effectiveness. This robust jamming system allows the operator to quickly program the unit using a Windows®-based laptop or USB stick, to adapt to any given risk situation or to use the system as a tactical jammer. The component’s key purpose is to protect the bearing vehicle from any RCIED threat that may arise, while letting radio communication for the passengers on board.